What are the Advantages of a Demi-Permanent Hair Color? Repeated hair coloring may result in dry hair. 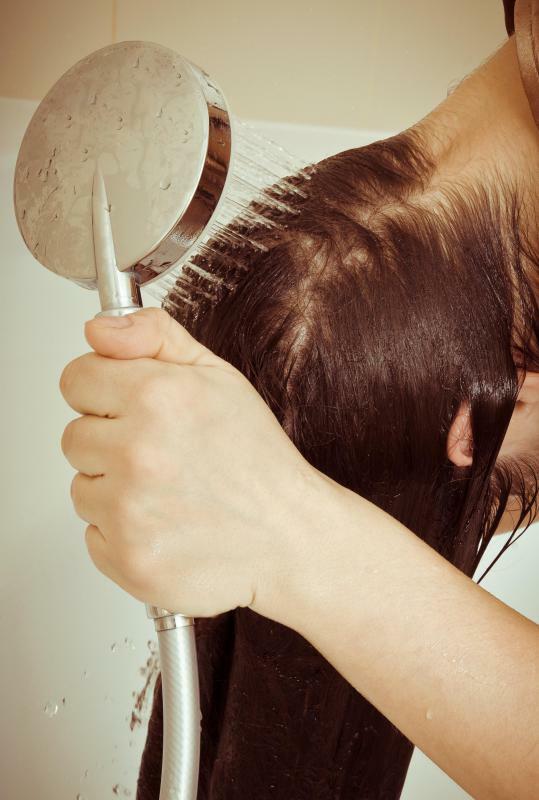 Some shampoos will fade demi-permanent hair more quickly than others. Demi-permanent hair dye washes out after about 24 shampoos. A root touch-up brush, which looks similar to a mascara wand, can be used to apply hair dye specifically to the roots. Demi-permanent hair dyes do not contain ammonia, unlike permanent hair dyes. Demi-permanent hair color is the "middle" type of hair color; not as long lasting as permanent hair color, but better able to cover grays than semi-permanent. 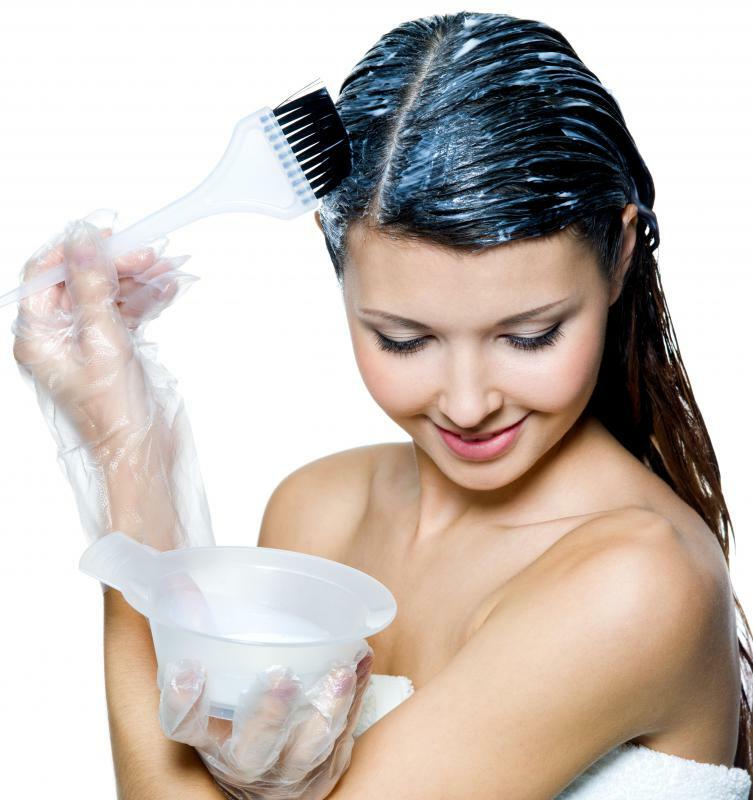 Unlike semi-permanent hair color, it is made with an alkaline agent as well as a developer such as hydrogen peroxide, but in a much lower concentration than permanent hair color. This means that hair is not actually lightened when it is colored with this type of dye. The obvious advantage to using demi-permanent hair color is that hair is not stripped of its color. The stripping process is very damaging to hair, causing it to become brittle and dry, particularly with repeated hair coloring. When using demi-permanent color, however, this is no longer an issue; the color is simply deposited on top of the hair. It covers gray hair much better than semi-permanent hair color, however, which is a main advantage. In addition, grow out is less noticeable when using demi-permanent hair color. In general, the color will gradually wash out in between five and seven weeks, which is early enough that roots generally do not show. In addition, this type of hair color often looks more natural than permanent hair color, because it allows the hair to retain more of its natural color and color variance; hair that is all one shade tends to look unnatural. In addition, demi-permanent hair color is easy to apply at home, and is sold in most drugstores, grocery stores, and discount stores. It is inexpensive and available in a wide range of shades, and may be used to create highlights as well. It is generally a better idea to use this type of hair color to darken hair; it will typically not work as well to lighten hair for the reasons mentioned above. Adding a bit of brightness or color dimension to hair with demi-permanent color is entirely possible, however. Finally, demi-permanent hair color does not contain ammonia, which makes it gentler on the hair. 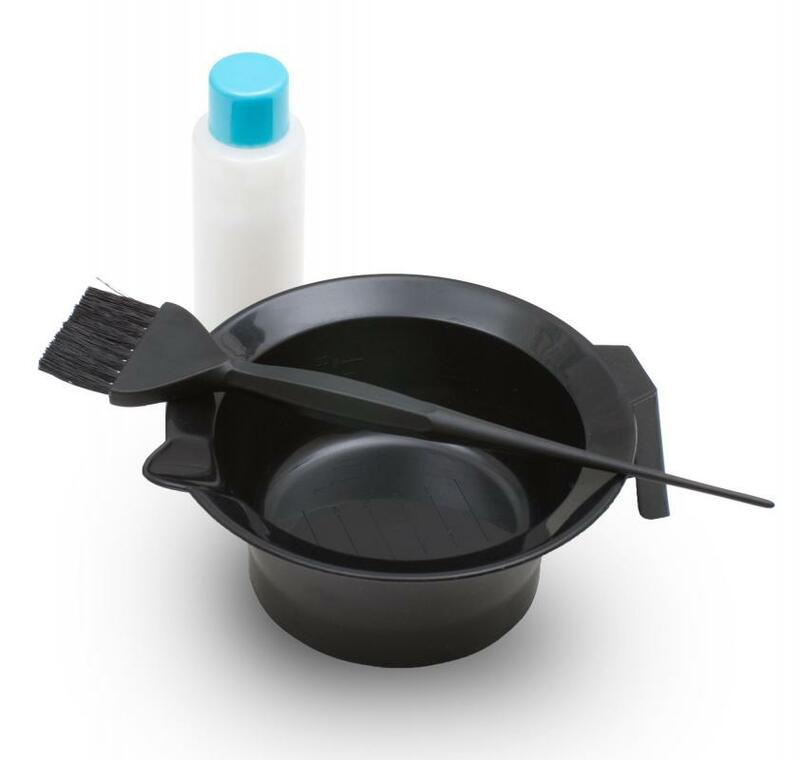 This means that this type of hair dye can be used to refresh permanent hair color that has faded, or may be applied to the hair after a damaging treatment such as a perm or relaxing treatment. If looking for a hair color that is long lasting and good at covering grays, but not overly damaging to fragile, dry, or treated hair, demi-permanent color is often considered to be the best of both worlds. What Were Some Women Willing to Risk for the Perfect Hair Color? How Do I Choose the Best Hair Relaxer? What Are the Best Tips for Hair Dye Stripping? What does a Hair Color Expert do? What are the Different Types of Hair Color Products? What are the Different Ways of Removing Hair Color? 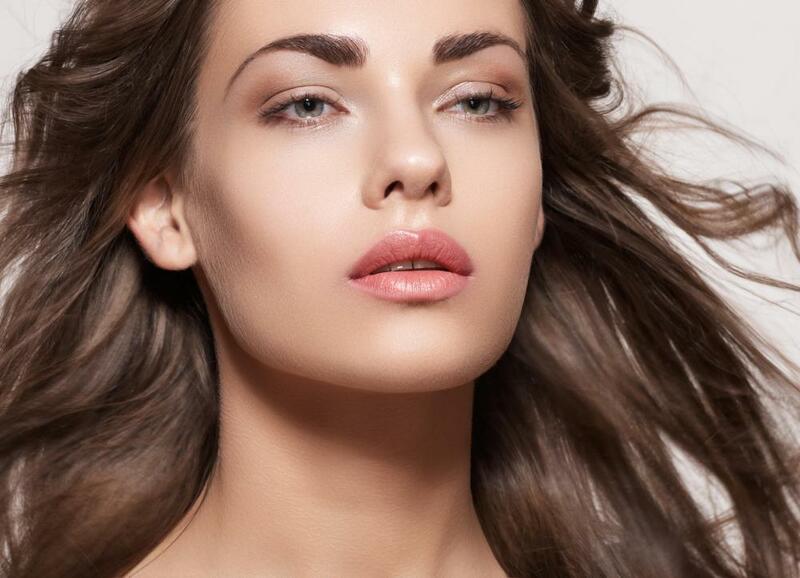 What Does a Hair Color Specialist Do? @pleonasm - That's really sad. Kids can be very cruel when it comes to things like that. Most demi permanent hair color is extremely safe, because it doesn't have the harsher chemicals used in semi and permanent hair colors, so it will be safer to use most of the time. But, spot checks are a good idea, particularly if you have sensitive skin. I've always a bit wary of getting my hair dyed at a professional hair dresser, because they don't really have time to do a spot check. I suppose they have the ability to quickly remove the dye though if need be. If you are really worried about the chemicals in hair dye, a good alternative to demi permanent color is to use henna hair dye instead. It won't usually be as vibrant, but it's actually good for your hair and it's fairly safe as well. @bythewell - My aunt had a reaction like this when she was a child and my mother thinks she never really recovered from it emotionally. She was just putting a color through her hair like all her friends had at school and she had a severe reaction that damaged her skin and left her swollen and in a lot of pain. Luckily my grandmother reacted quickly when she realized what had happened and was able to wash the dye out before it set. But, my aunt was already quite a sensitive girl and she was forced to spend weeks with her face in a mess and was teased quite badly at school. she never recovered it, even as an adult. And I know that she never uses any kind of makeup or hair products either, I suppose for fear that something else could happen to her. It's a shame because that hair coloring incident might have just been a one off accident, but it's wrecked her whole life. Always remember to spot check before using any kind of hair dye, even if you've used it before. They will sometimes change the chemicals in the dye without advertising it. All you have to do is look up pictures online of people who have had allergic reactions to hair dye to see what can happen if you don't spot check. Unfortunately, if it's a delayed reaction the dye is already absorbed into your hair so it's difficult to remove quickly. If it looks like you're starting to develop skin irritation or swelling, you should immediately go to a hair dresser to get the color removed. If it gets very bad, go to a doctor. The allergic reactions can look like severe burns and can happen with even the highest quality hair dyes. Just be careful. It doesn't happen very often, but it does happen.